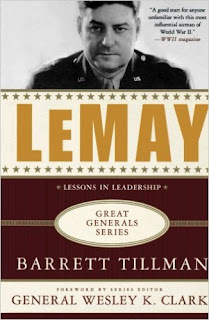 Curtis Lemay's career as an airman spanned several decades and many roles. his book looks at highlights of his life, as commander of a bomber wing in China, as the leader on the ground for the incendiary raids against Japan, and as the commander of Strategic Air Command. In every instance he brought a unit that was barely functioning and made it into a potent weapon of war. His story is an important one for anyone who really wants to understand the Cold War and what was at stake. The book does have one small issue. On page 22, in the chapter which discusses his assignment to 8th Air Force in England, there is a map of Europe which oddly enough shows the geopolitical situation between German Reunification in 1990 and Slovenia's independence in 1991. WHY this map would be picked to illustrate this book I have no idea. The map on page 54 seems to accurately portray WWII Asia during the period Lemay was there. A good book, although nothing more than an introduction.